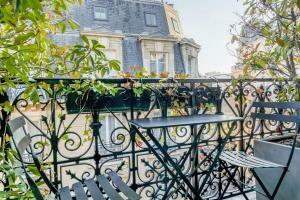 Just a 7-minute walk from Avenue Champs Elysées, this boutique hotel is set in a Parisian town house. It offers a spa, fitness centre, bar and restaurant. Free Wi-Fi access is also available throughout. Decorated in neutral tones, the bright rooms at Room Mate Alain offer a LCD TV with Canal+ channel and a minibar. 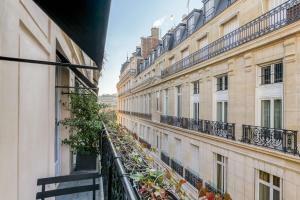 All rooms have an en suite marble bathroom and some have a private balcony with views of Avenue Foch. Breakfast is served every morning in the lounge bar, which features Moreno-glass chandeliers and a large cocktail menu. Gourmet cuisine prepared from seasonal produce is also offered in the restaurant. 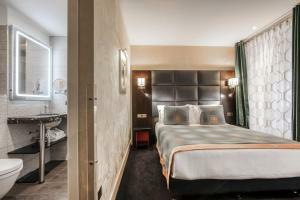 Argentine Metro Station is 100 metres from the hotel and provides direct access to Place de la Concorde, the Louvre Museum and le Marais district. 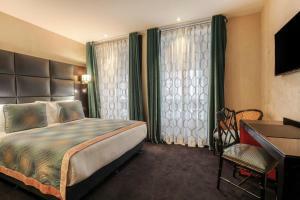 For guests travelling for business, Porte Maillot Congress Centre is a 10-minute walk away. Please note that cheques are not an accepted method of payment at the property. Please note that the credit card used to make the reservation must belong to the person staying at the hotel. This credit card will be requested upon check-in. Guests are required to show a photo identification and credit card upon check-in. Please note that all Special Requests are subject to availability and additional charges may apply. 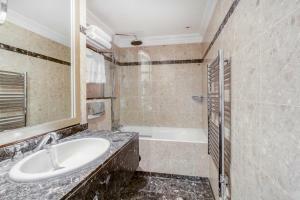 A marble bathroom with luxury bathrobes and slippers is offered in this room. A rain shower is provided. Rate: € 120.00 ... € 371.40; select dates below to get current rates.